I was originally making these slippers for myself but my mum has now claimed them. They are easily adjusted to any adult size. I am sure the same technique could be used for childrens slippers as well. Just make the rectangle base the same size as the child's foot and make a smaller square for the top. 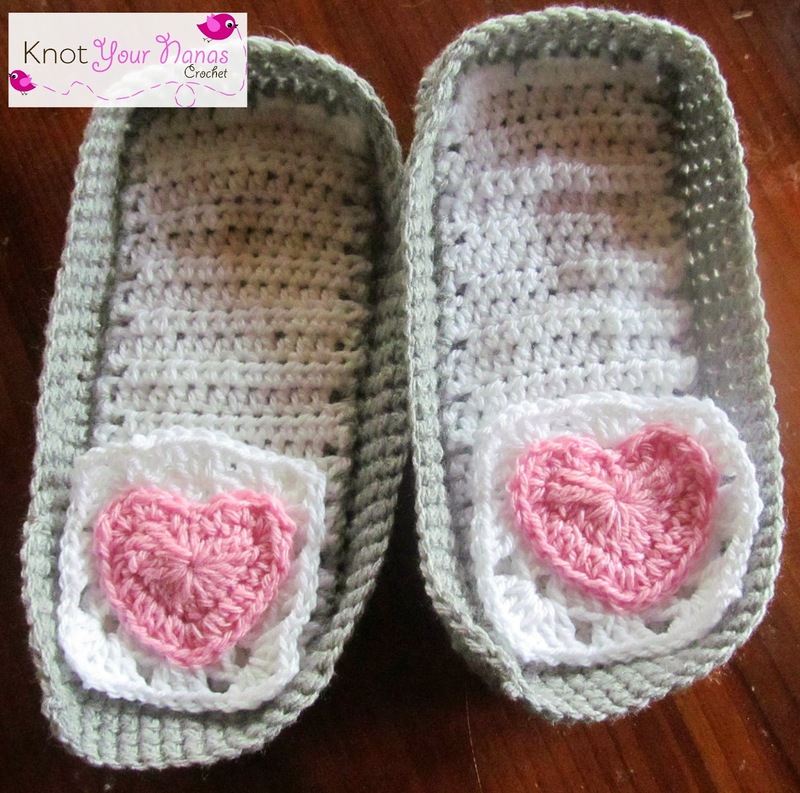 Any 4 inch square works for the top of these slippers or just be creative and chose a different applique to stitch to the top of the granny square in the pattern. Original slippers were made to fit a foot which is 9 inches in length. 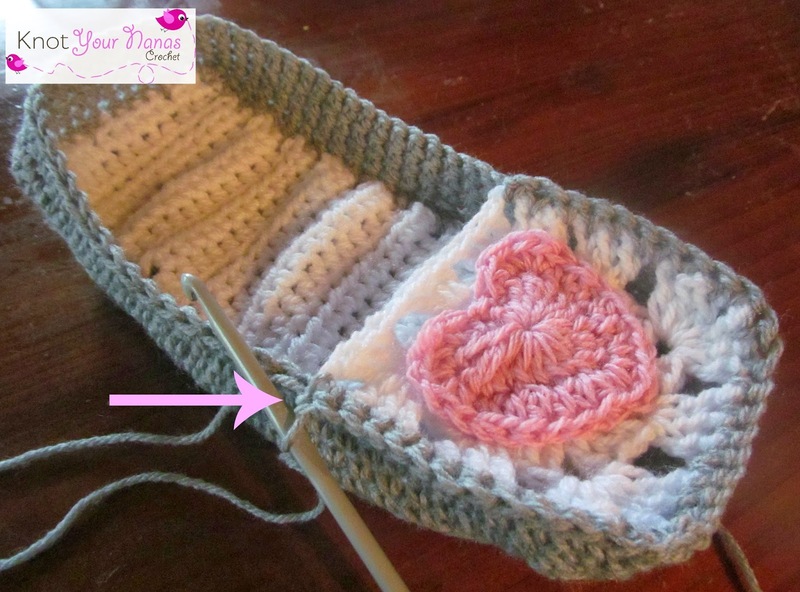 To adjust the length simply do more or less rows on the base of the slippers. When it comes time to sc around the base you will need to adjust the stitch count. 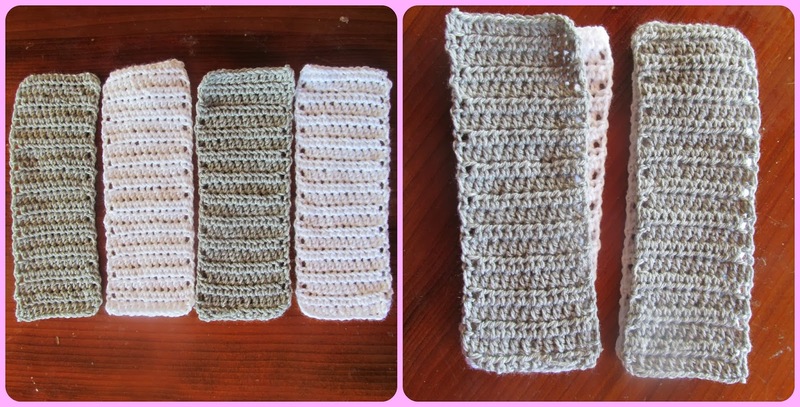 SC3TOG – Single crochet three stitches together. This is similar to single crochet two together but is done over 3 stitches. Base: make 2 white and 2 grey. Hold soles of slippers with wrong sides together (one grey and one white). 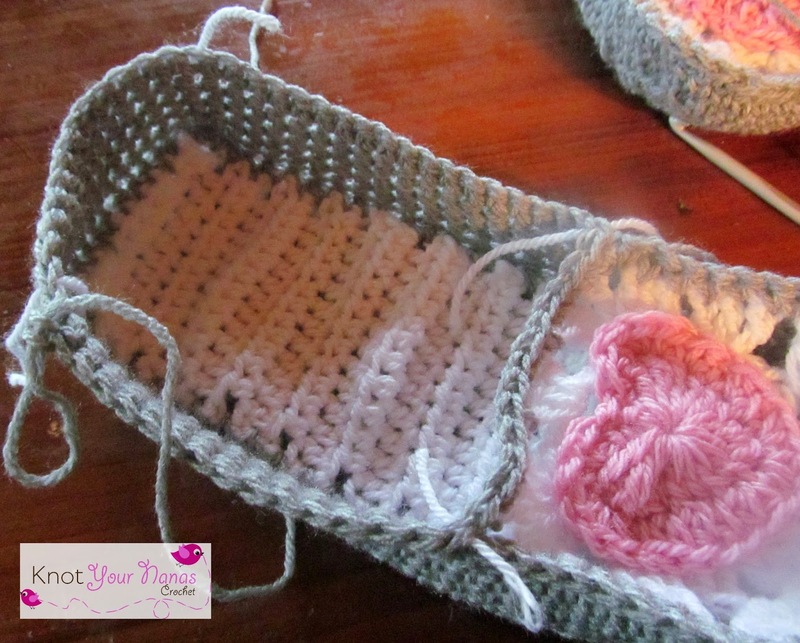 With grey (bottom of slipper) facing you join grey yarn in any stitch around. Make sure you place the same amount of stitches down the short sides and the same amount down the long sides. This will keep the rectangles even. For the slippers I made I had 22 stitches down the long sides, 11 stitches down the short sides and 3 sc in each corner for a total of 78 sc. Depending on what size you are making you will have more or less stitches down the long side. The way I kept it even was since I had 22 rows I did a stitch at each end. So if you have 20 rows do 20 stitches. Round 1: Working through both soles stitches. Ch 1, sc in each stitch around placing 3 sc in each corner. Join to BLO of first sc with a sl st. Round 3-5: Back working in both loops, ch 1, sc in each stitch around. Join to first sc with a sl st.
Any 4 inch square will work here but since Valentines Day is coming up I chose to do a basic granny square with a heart appliqué. 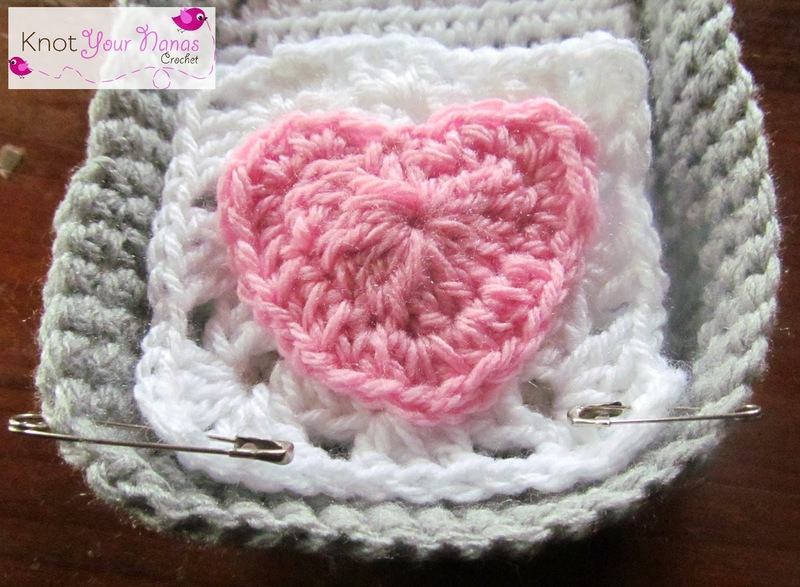 Pink heart appliqué - http://www.planetjune.com/blog/free-crochet-patterns/love-hearts/ I used the medium heart. Sew heart appliqué to square. Pin square at the corners to the slipper. I didn’t count stitches, just worked from sight. Join grey yarn in corner. Sc through both the sides of the slipper and the granny square to join. Pink arrow shows beginning of round 1 and remaining rounds. Once finished joining the granny square continue to sc down the side of the slipper, across the back and down the other side. Once you get back to the granny square work across the remaining edge of the square. You have now finished round 1 and are back to the beginning of round 2. Instead of joining rounds work in a continuous circle keeping track of the beginning. Mark each corner approx with a stitch marker or scrap piece of yarn. When you SC3TOG the marked stitch will always be the middle stitch of the three. The first corner is the beginning of round 2. Round 2: Sc to first marker (second corner), SC3TOG, sc to third corner, SC3TOG, sc to fourth corner, SC3TOG, sc to beginning of round (back to first corner), SC3TOG. Round 3-5: Continue to sc around making sure to do a SC3TOG in each corner. Finish off at the beginning after the last SC3TOG. Ahhh, they are so cute! Thanks for the pattern and the pictures (that's a good visual help). Thanks for the pattern! I've been wanting to make a similar pair but didn't like the way that pattern was done. This will be perfect. Oh my, they are so comfortable!. I made a daisy square. Thank you so much for sharing the pattern. I have never been able to find a good, comfy slipper pattern. Thank you. Will share my pix on Ravelry. Bravo! Yeah!! Thanks for the pattern...I only did one bottom in mine, due to being low on yarn and they came out great! We have ceramic tile in some rooms so I think I will put "no slip" on the soles. I'd hate to break a leg in my new shoe-booties. I <3 them! !